At the beginning of the academic year 2017-2018 academic year at the department of 23 academic groups, enrolled in full-time training and complete form 3 groups enrolled in full-time education abbreviated form. Total full-time students enrolled 386 students, including 358 full-time on a full course of study and 28 full-time reduced form of training, 131 grants. 13 academic groups studying the state language and 10 groups of students in Russian ..
4th year 1. AIU-14-1 Nurmagambetova Gulm.S. Serіkbay A. 2. AIU-14-2 Nurmagambetova Gulm..S. Bultbaeva A. 3. AIU-14-3 Saifulin RF Maykenova A. 4. AIU-14-4 Parshina GI Kusainov A. 5. EE-14-2 Smagulova KK Aқanova A. 6. EE-14-4 Kotov ES Rakhimov A. 3rd year 7. AIU-15-1 Nurmagambetova GS Kurmangaliyeva A. 8. AIU-15-2 Tolegen S. Үsenov B. 10. AIU-15-4 Kalinin AA Babazhanov K.
11. EE-15-3 Hairullina EK Musagulov M.
12. EE-15-4 Hairullina EK Makhmetov M.
13. EE-15-6 Ivanov VA Safarova I. 2nd year 14. AIU-16-1 Tohmetova KM Baқytbekұly A. 15. AIU-16-2 Tohmetova KM Tastybay R.
16. AIU-16-3 Sichkarenko AV Saduakas Ә. 17. EE-16-3 Sundet GE Serik A. 18. EE-16-4 Sundet GE Kuanyshbekov A. 19. EE-16-5 Kritskii AB Sengatulin I. 1 course 20. AIU-17-1 Beisenova A. Amanzholov E.
21. AIU-17-2 Beisenova A. Omirgalieva A. 23. EE-17-2 Ahmet G. Seitzhan M.
At the department 17 curators. Holders of the presidential scholarship students Bazylev BR (Gr. EE-15-4) and Rymbek AA (Gr.EE-15-3). The work of curators with parents: For the academic year 2017-2018 on WhatsApp program sent more than 950 messages, produced more than 110 calls and sent 7 registered letters by mail to parents of students who have received low marks for Landmark control having absences that have not undergone chest X-rays and not paid at the time of training. Conducting ERP: all students of academic groups issued promotional material and instructed to carry out professional work in schools and colleges, where they were trained in order to attract applicants for admission to a degree KSTU. 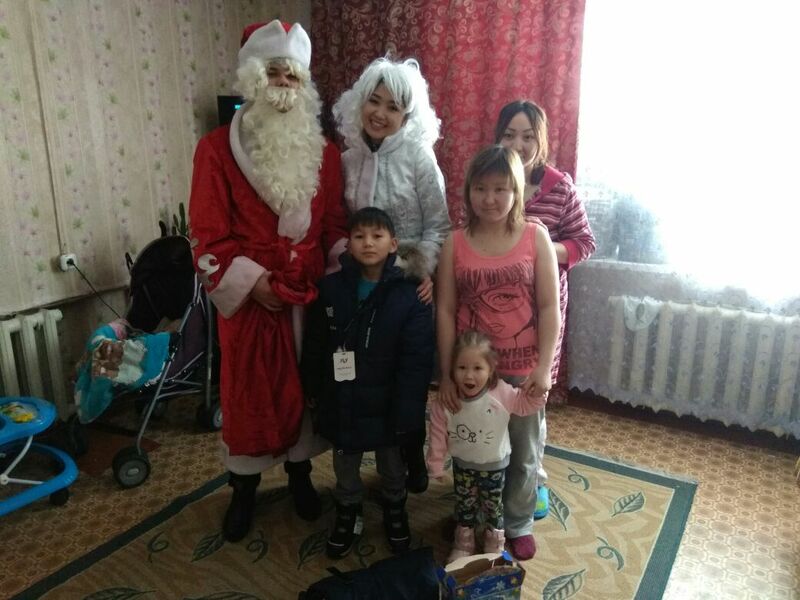 Working with students living in dormitories and rented apartments: During the year, curators and head of the department were on duty in the dorms according to the schedule. When on duty, curators avoided the room where our students were interviewed about the rules of stay in a hostel, the need to comply with cleanliness and order in the rooms, in the premises for self-employment and areas of cultural and community purpose, and to comply with safety rules and rules of fire safety when using appliances. APP students of the department take part in the sports life of the University and the city. The average performance of the department for the fall semester – 81%. Lowest performance was observed in Group EE 16sk 55.5%. The highest performance in the group AIU-14-4 – 88.6%. All parents of underachieving students have been notified, as well as an explanation of the situation GPA was given, and the rules of its calculation. Underachieving students were invited to the meeting of the department, where interviews were carried out with them. Students promised to liquidate the debt to the beginning of the session. The average performance of the department for the spring semester – 84%. Lowest performance was observed in Group EE 16sk 55.5%. The highest performance in the EE-15-4 group – 83.6%. All parents of underachieving students, who did not gain a conversion factor, have been notified. Students securing less than the conversion factor (GPA) concluded an agreement for the elimination of academic debts, for a fee from 01.06.2018g. on 31.07.2018g. Underachieving students were invited to the meeting of the department, where interviews were carried out with them. Under the guidance of the supervisor, Assoc., Dokt.PhD Smagulova KK Students Rymbek A. (gr.EE-15-3) took 1st place in the contest of presentations made using the Latin alphabet, which was held on October 13, 2017 in KSTU. 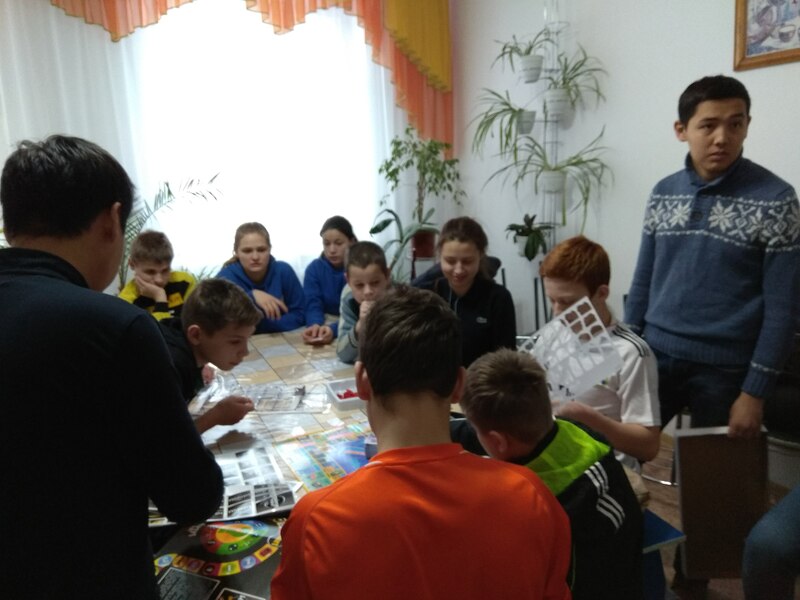 Under the guidance of the supervisor, students st.pr.kaf.APP Imangaliyeva K. (gr.EE 14-4) and Bice B. 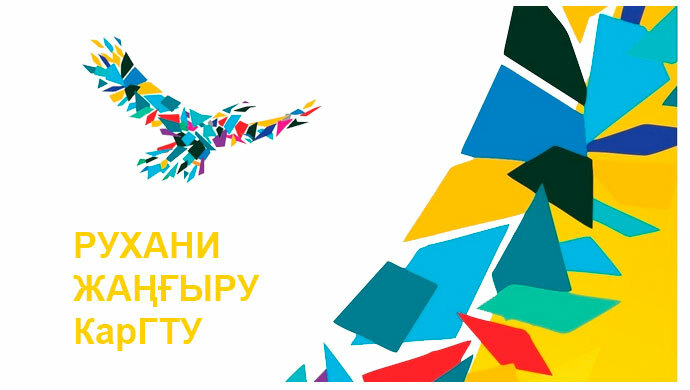 (gr.EE 14-4) prepare reports for participation in the international conference of AMIT (Russia, Omsk) and Saginovskie reading (Karaganda, KSTU). Rymbek A. (g EE-15-3.) And Babazhanov K. (gr AIU-15-4.) – an active participant in the circle “Өndіrіstіk protsesterdі avtomattandyru”. Under the guidance of the supervisor prof., Head. the Department of APP Breydo IV students of gr. EE-14-4 Bice VE and KJ Imangaliyeva involved in the MES Grant “Development of methods and means of reducing losses in the transmission power at the existing high-voltage overhead power lines”. ” The basis for performance: Disposal vice-rector for scientific work of 10.04.2017g. (Department of №6 minutes of the meeting of 11.07.2017). Beketbaev W. (gr.AiU-14-1) – the order №494 from 28.08.17g, Beijing Institute of Technology (Beijing, China) in specialty «Electrical Engineering». Silischa D. (gr.AiU-16-3) – Order №47 from 02.02.17g, Riga Technical University, Riga (Latvia). power automation systems Kazakhstan, Republican student scientific conference “The youth science contribution to the realization of Kazakhstan-2050 Strategy”, 12-13 April 2018, KSTU, Karaganda. transformer Kazakhstan, Republican student scientific conference “The youth science contribution to the realization of Kazakhstan-2050 Strategy”, 12-13 April 2018, KSTU, Karaganda. Dyche LI Development of robotic system Kazakhstan, Republican student scientific conference “The youth science contribution to the realization of Kazakhstan-2050 Strategy”, 12-13 April 2018, KSTU, Karaganda. conveyor belt Kazakhstan, Republican student scientific conference “The youth science contribution to the realization of Kazakhstan-2050 Strategy”, 12-13 April 2018, KSTU, Karaganda. management Kazakhstan, Republican student scientific conference “The youth science contribution to the realization of Kazakhstan-2050 Strategy”, 12-13 April 2018, KSTU, Karaganda. Voitkevich SV Mathematical modeling in the ATS Kazakhstan, Republican student scientific conference “The youth science contribution to the realization of Kazakhstan-2050 Strategy”, 12-13 April 2018, KSTU, Karaganda. Dyche LI The use of SCADA – system GENIE 3.0 in the learning process Kazakhstan, Republican student scientific conference “The youth science contribution to the realization of Kazakhstan-2050 Strategy”, 12-13 April 2018, KSTU, Karaganda. with one sensor Kazakhstan, Republican student scientific conference “The youth science contribution to the realization of Kazakhstan-2050 Strategy”, 12-13 April 2018, KSTU, Karaganda. Dyche LI Development and research of inverted pendulum Kazakhstan, Republican student scientific conference “The youth science contribution to the realization of Kazakhstan-2050 Strategy”, 12-13 April 2018, KSTU, Karaganda. 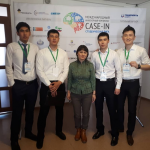 April 5, 2018 in KSTU Kazakhstan passed the qualifying stage of the international engineering Championship «CASE-IN 2018″. 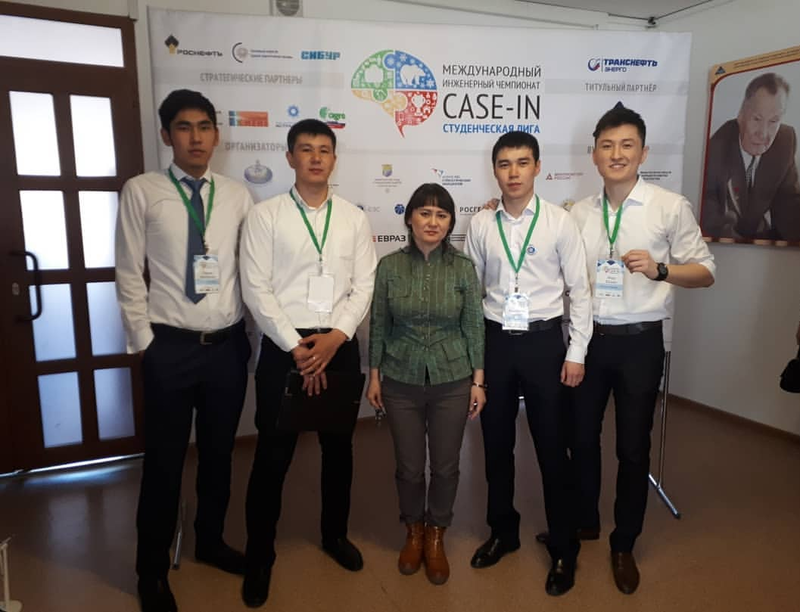 According to the results of the championship team «PRO Energy» won a ticket to the final in Moscow (supervisor Associate Professor of APP Smagulova teamKK). #PRO_energy team participated in the final (Moscow, Russia) International Engineering #CASE_IN championship. Students of the department APP (v. Gr. EE-15-4 Bazylev B. Sүyіndіk M. v. Gr. EE-15-3 Іdrіs J., st.gr. 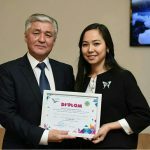 AIU-15-1 Abdikarimova C) received the prize 3 a place. The number of participants -10 people. Students gr.EE 14-4 Imangaliyeva K. and B. Bice prepare reports for participation in the international conference of AMIT (Russia, Omsk) and Saginovskie reading №10 (Karaganda, KSTU). Students gr. EE-14-4 Bayts VE Imangaliyeva KJ, MJ Karibaeva participated in the Republican student scientific conference “The youth science contribution to the realization of Kazakhstan-2050 Strategy”. Scientific circle. “Synergy-daғy” robottyқ tehnikalyқ zhүyeler (heads art. Ven. Marquardt RV, prep. Tohmetova KM). The number of participants -7 people. Students Group AIU-14-2 Қami Қ. and A. Serіkbay prepared the main sections of the diploma on the theme of «Simatic S7-314c kontrollerі nezіnde zhasalynғan oқu stendі“. 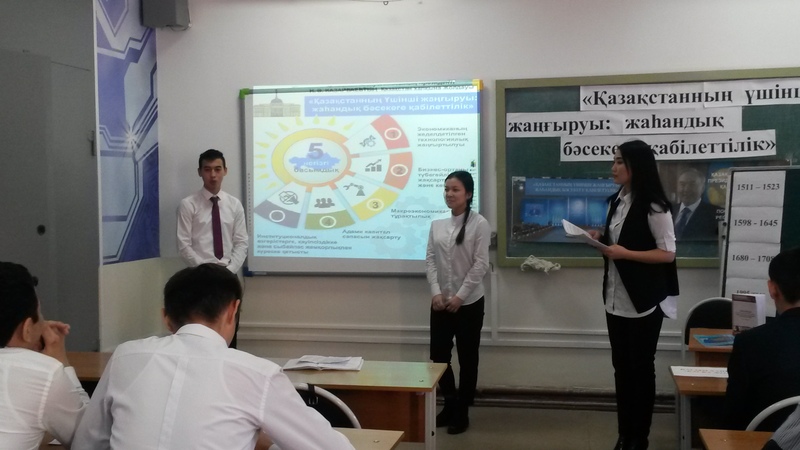 Students Group AIU-14-2 Krymov N. and K. Akhmetzhanov prepared reports for participation in the international conference of AMIT (Russia, Omsk) and Saginovskie reading №10 (Karaganda, KSTU). 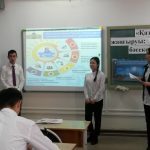 Students Group AIU-14-2 Akhmetzhanov K .. A. Imakayev and prepared the main sections of the diploma on the theme of «Simatic S7-1500 kontrollerі nezіnde zhasalynғan oқu stendі“. Babazhanov K. (gr AIU-15-4.) And Rymbek A. (g EE-15-3.) – an active participant in the circle “Өndіrіstіk protsesterdі avtomattandyru”. 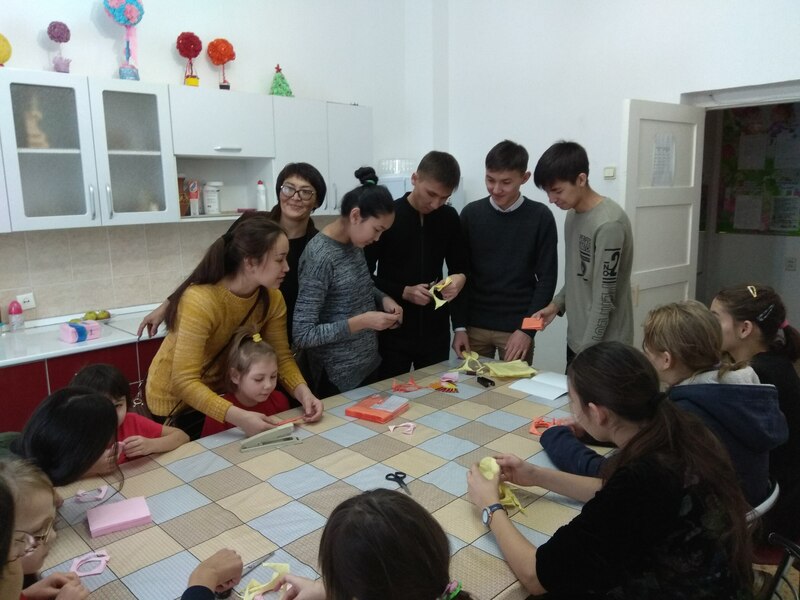 Students gr.AiU-15-1,2, trained under the program of internal academic mobility in Karaganda State Industrial University (KGIU) Temirtau 5 semester 2017-2018 uch.g ..
During the year, the Department of APP students went to all the city, the university and cathedral voluntary work on improvement of the city, the territory of KSTU, classrooms and laboratories. November 29, 2017 in the Theater. KS Stanislavsky was held inter-faculty stage of the competition of talents “Debut Freshman – 2017”. The competition was attended by students of the first courses of all faculties, as well as students of the College of Innovative Technologies, showing the jury his talents. In the category “Star debut” won Қobylandy A. For a bright oriental dance performance in the category “Best Dance” won Ovsyannikov D. (gr AIU-17-3.). 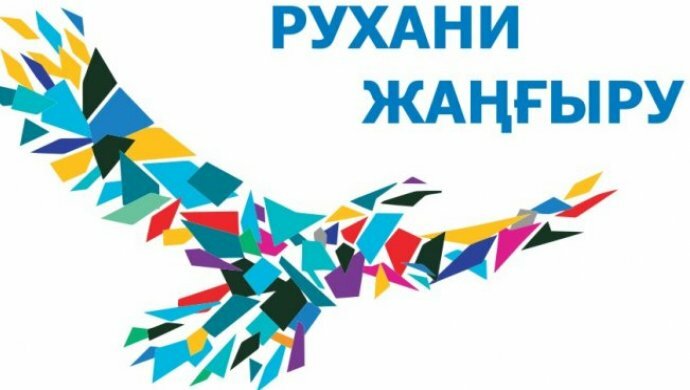 On November 29, the Karaganda Banking College named JK Bukenova passed the regional festival «Youth – the future of Kazakhstan», devoted to Day of the First President of the Republic of Kazakhstan. The event was attended by over 600 students participating. In the nomination “Best Vocal” won 4th year student gr. AIU-14-1 Zhylkaydarova A.
December 9 students of AIU-16-1, 2 and Volunteers Foundation Akniet visited the children’s home, which is located in Temіrtau “Aynalayyn”. 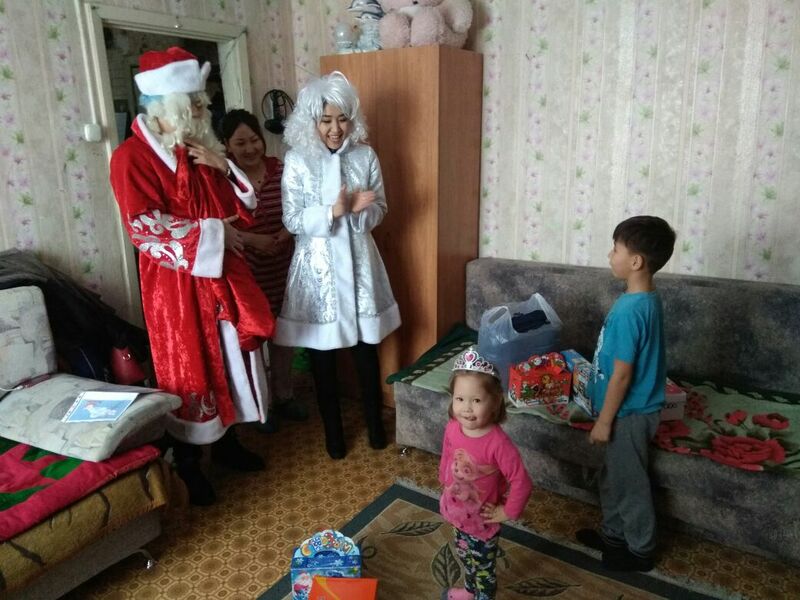 Children aged 5 to 16 years, left without parental care, got sweet gifts and toys purchased their older friends. 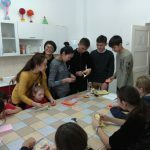 In turn, the guys had guests at the children’s home, demonstrating their crafts and drawings, and made a real concert with poems, songs and dances, what brought a lot of pleasant moments to the audience. To us at the Department of APP received a letter (from IBO “Aқniet”) from a little boy Damir. The letter was addressed to Santa Claus. After reading the letter, the employees of our department will gladly decided to fulfill the dream of the boy. 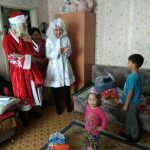 To congratulate the children and give them gifts to teachers of the department APP in Christmas costume Santa Claus greeted the children. 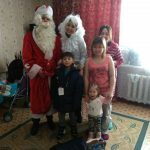 Hike Santa Claus to Damir and his sister Aylane, he was successful: the children and their mother were delighted – it was very nice to see them happy children’s smiles. a round table was held 02.21.2018 at the department APP. The theme of the round table: “The message of the President of the Republic of Kazakhstan NA Nazarbayev “New opportunities of development in the conditions of the fourth industrial revolution ‘.” The purpose of the round table – to reveal a wide range of opinions on the round table the issue from different perspectives, to discuss the problem does not clear moments associated with the subject, and to reach a consensus. The task of the round table is to mobilize and activate the participants on specific topical issues. At this event, the chairman of spiritual and moral education KSTU Kyzyrov KB, who said that in the President of the Republic of Kazakhstan – Leader of the Nation NA Nazarbayev to people of Kazakhstan “New opportunities of development in the conditions of the fourth industrial revolution” were clearly the main objectives for the development of the country. This Epistle determines what is needed to successfully navigate and adapt to the new world – the world’s fourth industrial revolution. Scientists are among the first to react to the message, giving her, historical, assessment. Head. the Department of APP, Professor Breydo IV added, the main condition for the development of independent Kazakhstan – is the modernization of the industrial sector. It is well known that the success of any country depends on the development of the industry, industry of new technological methods. Industrialization will create new growth points: the construction of housing, factories, medical centers. No less important is the fact that Kazakhstan will build a lot of roads that will reduce unemployment. In this connection, I recall that in 20-40 years of the Soviet power also to industrialize in Kazakhstan, but that industrialization carried out by administrative and by force, with the use of prison labor. Such as the cities of Kazakhstan Karaganda, Ekibastuz, Zhezkazgan built with the participation of prisoners, and that industrialization has caused him and the tragic pages of collectivization. But the current industrialization carried civilizational methods using international experience and innovative techniques. Students Adamidi V. Akbieva I. Kozhahmetov E. Kosmynin D. Konyr M. Ovsyannikov D. E. Ospanov, Moldaқұl E., A. Capas, seine M. made presentations on 10 goals President’s Address. February 12, 2018 at the Department of the APT meeting was held freshmen group AIU-17-1, 3 with a member of the Afghan war, a senior lecturer at the Department of APP Em GA, dedicated to the Day of the withdrawal of troops from Afghanistan. GA Um shared his memories as a student he had 1 course of a specialty “Mining equipment” was drafted into the Soviet Army. And get directions to serve in a hot spot, to perform the international duty. 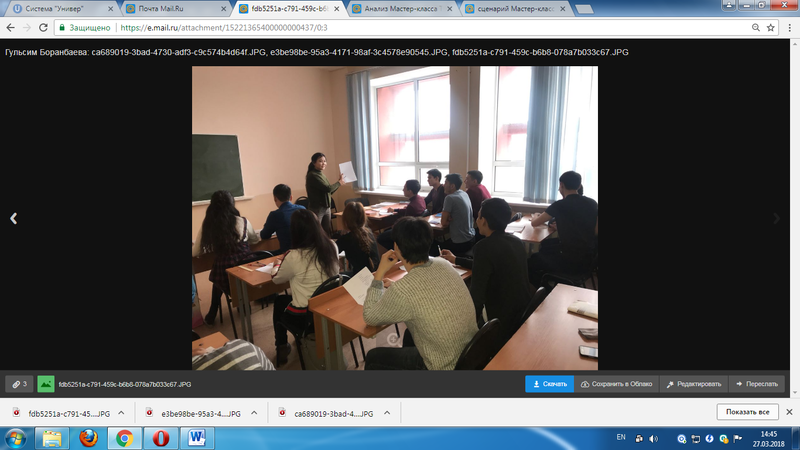 GA Um presented a presentation on the Afghan war, and talked about the soldiers-internationalists, also called up from the Karaganda Polytechnic Institute, with the first course. The story caused a great interest among students and a lot of questions on this subject. March 2 at the Palace of Youth “Zhastar alemi” evening of poetry was head of the department APP, Professor Joseph Breydo Vulfovich. Guests of the evening were close friends, colleagues, pupils and students of Joseph Vulfovich. Especially for evening students and undergraduates of the department APP prepared and read your favorite line from the collections of the author. Poetry reading by students Tairova G. Muratov A., and A. Kushabaeva undergraduates Ahmet G., and A. Ganovskogo Abisheva AD have shown that they understand the meaning of the verses and in something even close. That is how the audience perceived their performance. Throughout the evening poetry reading Joseph Vulfovich accompanied by wonderful music tracks and kui. Sounded gentle poetic lines of work “otpeli the songs of nightingales …”, set to music by the famous bard Cheboksary Oleg Koch. At the end of the evening performed by Associate Professor of APP Voitkevich SV It sounded beautiful poems the author of “The rain has passed …”. The evening ended with the poet’s words of thanks to the guests. APP students in the department during the school year to actively go to the theater to them. Stanislavsky and them. Seifullin went smoothly on all solemn rallies and marches, football matches are attended and actively participated in activities such as: May 1 – the Day of Unity of People of Kazakhstan, May 9 – Victory Day and others. The King and Queen »VI Bala Rector KSTU udostostoilis students of AIU-17-2 Tөleu Temіrlan and Smailova Damir. 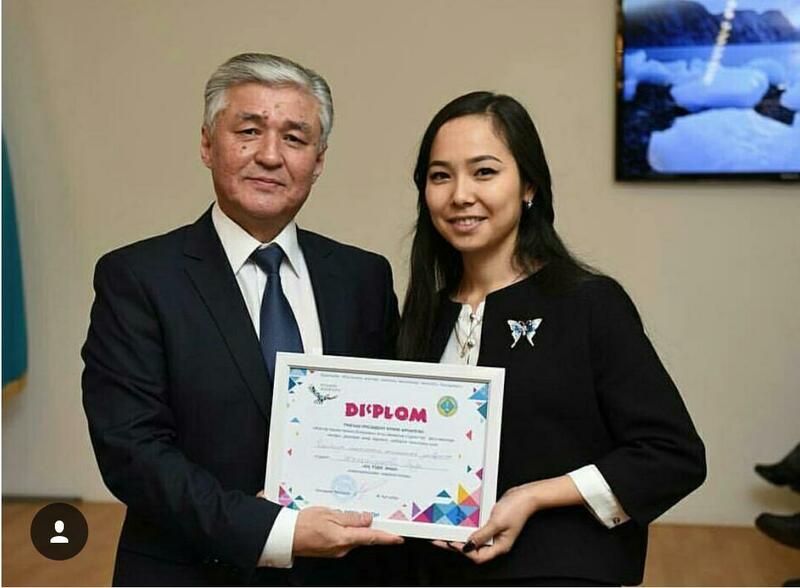 During the fall semester of 2017-2018 academic year held one workshop curatorial hour EE-17-2 group (curator Omar TT) on “The Message of the President of the Republic of Kazakhstan NA Nazarbayev “The third modernization of Kazakhstan: global competitiveness,” dated January 31, 2017. “. In conducting master classes curator hours used multimedia presentations on the subject of the film the video for a demonstration that used a projector, a desktop computer, speakers with audio amplifier, a projection screen. Master class was organized on the principle of intellectual games. Students were divided into two competing teams. The competitions were held in three phases. Quiz the thematic issues in which students competed in the completeness and accuracy of the responses to questions. During the spring semester of 2017-2018 academic year held one workshop curatorial hour AIU-17-1 group (curator A. Beisenova) on “Bolashak ozdіgіnen baskarylatyn kolіgі”. In conducting master classes curator hours used multimedia presentations on the subject of the film the video for a demonstration that used a projector, a desktop computer, speakers with audio amplifier, a projection screen.